They said they wouldn't do it 1999. And they said it again in 2003. But now the Canadian Radio-Television Telecommmunication Commission is getting set to regulate the internet and they want Canadians to help them set the terms for an upcoming hearing into the matter. The CRTC is Canada’s federal communications regulator. In 1999, they took the position that the internet was mostly alphanumeric text, not technically sophisticated enough to provide audio and visual content easily, and not of sufficient interest to consumers of audio and visual content to warrant regulation. Well, that’s changed, and regulations are coming. In Broadcasting Public Notice 2008-44, the CRTC has announced a major investigation into the feasibility and scope of regulating content on the internet. But before they rip open the discussion, they want input from Canadians about what questions to ask -- What areas to focus on? What concerns should get priority? For example, should questions about net neutrality be raised? This is a chance to have legislation put into place that will protect net neutrality. Are there practices that effect distribution of and access to Canadian new media broadcasting? Is the new media broadcasting environment contributing sufficiently to the achievement of the broadcasting policy objectives of the Broadcasting Act? Who are the relevant stakeholders in the creation and distribution of Canadian programming in the new media environment? » continue reading "CRTC preparing to regulate the internet"
Canadians outraged by the slow strangling of the internet are invited to share their outrage with the Parliament of Canada on May 27th. 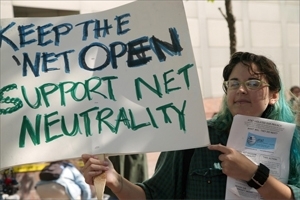 The Net Neutrality Rally will demand legislation to protect the internet from predatory practices like traffic shaping and data management, and to encourage transparency among ISP companies. Transportation assistance is available -- check out the Net Neutrality Rally website for more details. This is an important first step in the battle to save the internet -- a strong showing at this rally could be the beginning of legislative protection for net neutrality in Canada. For more info on the net neutrality movement in Canada, check out savethenet.ca. Bell Canada - Canada's largest internet provider - is going ahead with its plan to undermine net neutrality. They call it “traffic shaping” and “traffic management”, but what it adds up to is the end of net neutrality for anyone on the Bell system. This includes Bell customers and non-Bell customers who contract with third party ISPs who use the Bell system. Bell and other Canadian ISPs such as Rogers have been “traffic managing” for over a year, slowing some kinds of traffic down while privileging others. The data that Bell tends to target for slow down is peer-to-peer and torrent traffic. Last week, Bell applied the same “traffic shaping” controls to its third party ISPs, service providers who use the Bell system but who are independent companies with their own clients. What this means is that Bell is screwing, not only with its own customers' data, but with the accounts of third party Internet users. Do you know whose system your ISP is using? April 7 is the date Bell has set to have the “traffic shaping” procedures implemented across its entire network. Check out the Bell the Throttler video -- helps to explain the warp and waft of the Bell attack on net neutrality. For more information, check out Michael Geist's blog . To get involved in the campaign to save the internet from telecommunications robber Barons, contact Campaign for Democratic Media.